Justice Saliu Seidu of the Federal High Court sitting in Port Harcourt has imposed a fine of N500,000 on the wife of former President Goodluck Jonathan, Patience for withdrawing a suit instituted against the Economic and Financial Crimes Commission (EFCC). 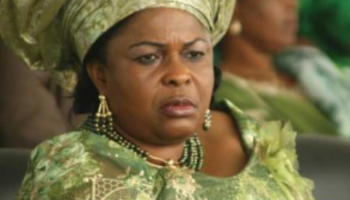 Mrs Jonathan had in February 2017 instituted a suit against the EFCC in which she was seeking an order of the court for the “enforcement of her fundamental rights to own property, fair hearing, human dignity, private and family life and freedom from discrimination”. The plaintiff through her counsel, Ifedayo Adedipe had prayed the court to restrain the EFCC from infringing on her rights. Counsel to the EFCC, Kayode Oni, faulted the former first lady on her prayers before the court, arguing that her suit was “an abuse of court process”. At the resumed hearing of the matter on Monday, Sammie Somiari who represented Patience addressed the court on a notice of discontinuance of the suit. He said he had “an instruction” of his client to discontinue the matter, adding that an application had been filed before the court to that effect. On his part, Oni submitted that Mrs Patience had a right to discontinue the case, but pressed for a charge of N500,000 as costs of filing processes in response to the suit. This was contained in a statement issued by the EFCC Head, Media & Publicity, Wilson Uwujaren.